The ultramobile High-Power-Therapy-Laser with up to 5W. High-Power-Lasertherapy. Up to 7W for deeper treatment areas. High-power laser therapy with OptonPro offers a very wide range of applications: pain therapy with local efficacy directly at the site of pain. In addition to the analgesic effect, biostimulation achieves accelerated tissue regeneration. Indications primarily include musculoskelettal diseases, tendinopathies, neuralgia and skin disorders. Some of the laser energy is converted into chemical reaction energy, thereby stimulating molecules directly through the transfer of electrons and indirectly through the formation of oxygen radicals. Of primary importance are coloured molecules of the respiratory chain, such as flavoproteins and cytochromes. The result is increased activity of the energy metabolism, called “biostimulation”. The stimulation of the energy metabolism in the cellular respiratory chain also manifests as faster healing of tissue lesions. This effect is independent of the thermal effects of laser light. 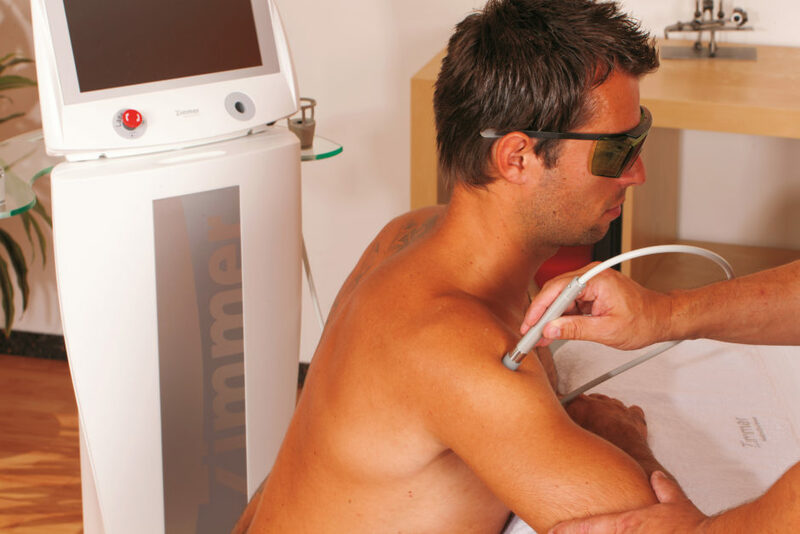 The therapeutic effect of the OptonPro laser is crucially dependent on the thermal component of energy transmission and the thermal characteristics of the tissue, which depend on the respective tissue’s thermal conductivity and thermal diffusivity. In physical medicine, therapeutic heat effects in the temperature range up to approx. 43°C are desirable. Laser light is scattered and absorbed in the skin and therefore largely converted into heat. A mild thermal stimulus to the nociceptors of the skin triggers the known segmental pain-inhibition reflexes through the first-order and second-order neuron as described in the gate-control theory. Strong thermal stimuli activate the neural and humoral endorphinergic pain‑inhibition system. Both mechanisms are suitable for the treatment of pain in the musculoskelettal system. Segmental reflexes that are activated by laser light cause muscle relaxation as well as inhibiting pain. This requires strong thermal stimuli. The described acceleration of healing processes primarily manifests in the form of fibroblast activation. It is important to note the non-thermal nature of this activation, meaning that only small amounts of laser energy are required. The attenuation of the laser light in the tissue depends on the localisation of the lesion and determines the laser power required, thus deeper structures such as tendons or joint capsules may require the application of high doses to the surface.